Hacerse un lugar. Circuitos y trayectorias juveniles en ámbitos urbanos (Making a place for your own. Youth circuits and paths in urban settings) is a collective investigation about urban youth practices. The book aims to analyze urban practices, circuits and trajectories from the Metropolitan Region of Buenos Aires.Using an ethnographic approach, each chapter pursues different urban circuits and social and biographical trajectories: showing, dancing and acting of punks, “breakers” (break dancers) and “cirqueros” (young people who practice circus activities) in their movement through the city [Chapter 1]; urban circuits resulting from two opposite educational youth practices (applicants policemen and elite university students) [Chapter 2]; the dispute about the use and sense of main public space when it is “occupied” by youth from outskirts [Chapter 3], political practices of young people engaged with political movements in poor neighborhoods [Chapter 4]; relationships between space and age in the process of socialization of children and youth within an outskirt neighborhood [Chapter 5]. 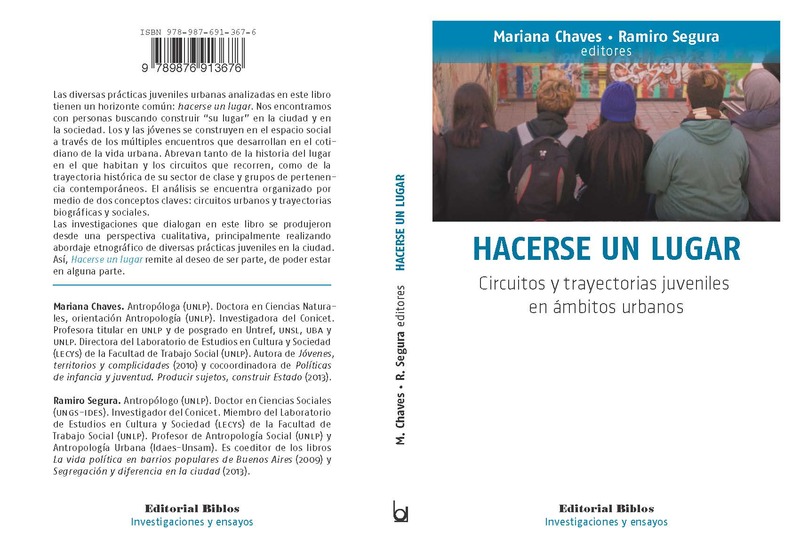 The different practices analyzed in this book have a common horizon: they make themselves a place in the city, they talk about people seeking to build their “own place” not only in a specific space but also in the society through the development of multiple meetings in their daily urban life.